I DO MIND DYING: Danse Précarité, a work by Wildcat! 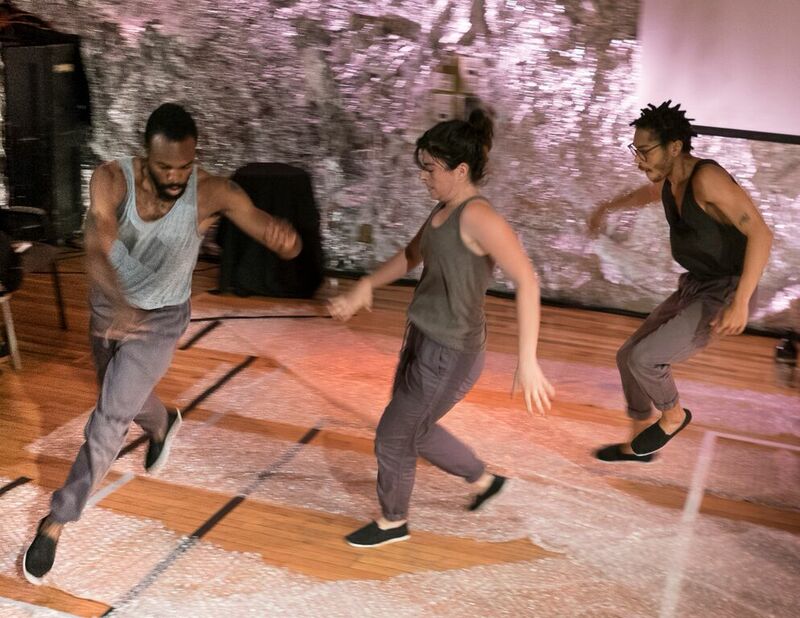 dance collective, is presented as part of Forward Ferguson, a series dedicated to furthering the conversation around racial justice in America. I DO MIND DYING was one of two performances presented by the collective during the weekend- the second, called 3 Meaningful Meditations, drew inspiration from Paulo Freire’s Pedagogy of the Oppressed. Both works were performed by Wildcat! members Jeremy Toussaint-Baptiste, Eleni Zaharopoulos, and André M. Zachery. We are seated single file along three sides of the space, surrounding the stage at JACK. As I come in, the dancers are warming up in the center, with structures of pliés, chassés, stretching, spoken before and then executed by the dancers, casually, with a sense of effort and verbal admissions of failure or discomfort. Being generally fashionably early, and therefore the second person seated, I see about 20 minutes of the warm up, which repeats in forms – it is structural, elemental, building in some ways like a traditional modern dance class. I’m given a handbook called the “Wildcat Manual for Tactical Self-Enfranchisement” – a booklet which opens with a quote from the ballad “Please Mr Foreman” from Detroit blues man Joe L Carter “…I said, no – don’t mind working, but Lord, I do mind dying.” Toussaint-Baptiste, Zachery and Zaharopoulos continue warming up as I read through the booklet, which includes the mission of Wildcat!, both a dance collective and a group with a mission to support one another through “solidarity in precarity”– committed to educational, empowering, and action-inspiring social interactions. While not necessarily focused on performance as a representation of that, the collective promotes the choice of members to perform (while also including other forms of creation). In addition to the mission, the booklet includes the performance score for the work and other writings, including information and quotes about ethics and identity, and it feels like an equal part of the experience to the performance. I DO MIND DYING is set up as a performance in three acts, with an overture at the beginning and a finale. The system and structure of the work is specific and illustrated – each act including an eight minute section (reflecting the 8 hour workday), each act containing a solo, each section creating and sustaining an element of exhaustion, and each section containing repetition. There is an almost contractual transparency in the dictation and mission from the onset – the setup of the performance score is included in the booklet, speaking both to the mission and the elements of this practice. From the warm up overture, we move into the first act which umbrellas Navigation-locomotion-collision, assembly. The performers use gaff tape to mark three overlapping squares. 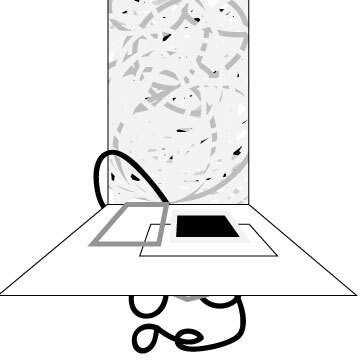 The performers use gaff tape to mark the floor with three overlapping squares and the game begins: each performer must go a certain number of times around the square. If you collide with someone going around their square, you must pick up the other person for a rotation around your square. It’s easier to finish earlier when your square is smaller, and not colliding with someone makes it easier still. The work begins to graphically break down larger conversations, larger blankets and markers. They are specific and task-based sections illustrating work, or choice. Here we tackle the abstract with tangible, this is an indefinable thing. This could be a Venn diagram of privilege. This could be a graph for inclusion. Each segment is delineated by a whistle blown by the sound guy, who is this Wizard of Oz figure, creating action, a new task, a new scene. Each segment feeling very TO-DO list driven – here we are moving together, down, deep down, through lines and action. Pushed by outside forces – tasks which vacillate between game into work into pain, which seem at once a choice and a chore- self-imposed and imposed by an unseen force. Working to and past exhaustion – duration and spectatorship. Army fatigues, and the show of work to see sweat and bodies to exhaustion. And repeat. To be seen is hard. Not to be seen is also hard. A choice to perform, a choice to be seen. The work builds because the tasks keep coming – it is exhaustive and continuous. The performers push into forced release and continue to push, and we are sitting, watching, watching. 8 minutes of laying down and standing up and smiling the whole time (Eleni), 8 minutes in a push-up, down to elbows and back up to plank (Jeremy), 8 minutes of shifting side to side (André), and the change happens over time, it is immeasurable in increments but appears over time, the repetition bringing out a looseness in musculature, clothes getting darker with sweat, a little tremor building, a smile, and although largely constant, hiding something too after time, Eleni continuing to smile as she sits and stands and sits and stands, looking at every audience member, smillliiiinnnnngg, am I smiling?, maybe, maybe she means it, maybe she hates it, but she continues, locking eyes. Out of the sections which illustrate the tight segmentation, in each act a solo emerges and loosens the structure. The form is released. In one solo, two buckets on the back of the stage are upturned to reveal lights, and Zaharopoulos and Zachery follow and illuminate Toussaint-Baptiste through an individual exploration. Release and tenderness – finding balance through pushing off center, and extremities in a way of release. Kilter/off kilter, explosive tenderness, combustion. Release/relief – constriction and freedom. As performers, we can put our bodies to a brink, and then find that there’s a place past that. There’s an exhaustion that’s sort of a yellow line, and then there’s exhaustion that’s a red line, and then if you go past that red line, there’s something else. Where nervousness disappears, everything dissipates and you can hear your heartbeat in your brain, ears, tongue, eyes, femoral artery, into desperation, into forced letting go, to find unburdened articulations and release. I DO MIND DYING, full of chapters, lots of stuff, lots of work, touches on isolation but also community. When the group eats a bag lunch on a bench in front of a video of a man speaking of his time working in factories in Detroit, I see these three performers as friends, as allies. They are eating on a bench in the 50’s outside of work, they are at Tompkins Square park this weekend, they are at a community pool, they are on break. From the beginning, the introduction of warming up, seeing the dancers in preparation, seeing the performers seeing us, and the subsequent work is able to be a piece of activism as well as larger philosophical work – conversations – how do we support each other? How do we exist as a chosen group? How do we (both this microcosm of chosen alliance and larger, broader social consciousness) find and support one another? I DO MIND DYING sets up a structure for reflection. I think about hard work. I think about a power which comes in connecting with others who are pushed to the edges. I think about the potential for otherness to coagulate into strength. More about JACK’s season at jackny.org. More about Wildcat!’s mission and upcoming events at solidarityinprecarity.com. Unless noted, images created by Katie Dean. THIS IS NOT A REVIEW is a series of visual and written artistic responses to dance and performance. the series is centered around inspiration, proposing response as a form of loose preservation rather than criticism or time-bound documentation. Tagged with: André M. Zachery, Eleni Zaharopoulos, JackNY, Jeremy Toussaint-Baptiste, Katie Dean, Wildcat!